The best New Orleans slip and fall lawyers will tell you that when someone is injured on the property of another, and is injured by way of falling down or tripping, they can bring a lawsuit based on negligence of the property owner if they can prove the owner's negligence. Louisiana's slip and fall attorneys know that the property owner is liable, or legally responsible, if their negligence or recklessness led to the accident. The plaintiff, or the injured person bringing the lawsuit, has the burden of pleading and must show facts that, if true, would grant the plaintiff relief in the form of damages. If the facts could grant the injured party relief, they then have the burden of persuasion, meaning they must convince the jury. In a slip and fall case, the plaintiff must show how the defendant didn't meet their standard of care and thus was negligent. To prove negligence, one must first ask if any duty was owed by the property owner to the injured party. In general, a duty arises to take reasonable care, to act how a reasonable person would, whenever a person's affirmative action places others at foreseeable risk of physical damage or injury. A property owner owes no duty to an unknown trespasser, but has a duty to warn of hidden dangers if the party is a licensee, or someone on the premises for social reasons. There is also a duty of reasonable care, to make the property safe or warn of the danger, if the party is an invitee, or someone invited on the premises for business purposes. In slip and fall cases, the property owner owes a duty of reasonable care to those invited on the premises for business purposes. But what exactly does reasonable care entail? Reasonable care, in a slip and fall case, depends on the property owner (or employee) knowing of the dangerous conditions, and if not, how long the dangerous condition existed, which determines whether the property owner should have known of the condition. If the property owner or someone working under the owner created the dangerous condition and did not take steps to warn or the condition, the property owner will be liable for the injuries suffered because of the danger. If the owner did not create the condition, the longer a dangerous condition exists, the more likely a property owner is to have not met the standard of care to make the premises safe. However, if the condition was created just seconds before the injured party slipped, it may not be the property owner's fault, because they cannot be expected to clean up spills or other dangerous conditions within seconds. Even if the injured party can prove the defendant's negligence in letting the dangerous situation unfold, the plaintiff must also prove that the dangerous conditions actually caused the fall. One's own carelessness will not let them recover in a court, as the business owner would not be negligent. 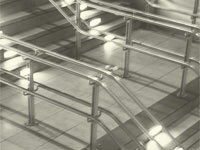 For example, if someone fell down a staircase, but did not use the provided handrails, they will struggle to prove the handrail owner's negligence. Further, if a grocery store had a spill, cleaned it, put up a 'Caution: Wet Floor' sign, but the floor was still wet from cleaning, the store will have likely negated their liability by putting up the sign and giving notice to those in the store of the wet floor. There are two approaches to slip and fall cases in the United States, the first, known as The Traditional Approach, is followed by 26 states, including Louisiana (La. Rev. Stat. ß 9:2800.6(B), and requires showing that the danger existed and caused the injuries, and that the owner failed to use reasonable care to cure the dangerous conditions. These cases usually come down to whether or not the injured party can prove that the owner knew or created the condition, or that the condition existed for so long that the owner should have known. Proving this 'constructive notice' (proof that the condition lasted for such a time that the property owner would have discovered the condition if he had exercised reasonable care) usually depends on proving the length of time the condition existed, which is evidenced by how old the condition looked (for example, a brown banana peel has been on the floor longer than a yellow banana peel), video evidence, or whether or not a liquid had dried or was still wet. The other approach to slip and fall cases is called the Mode of Operation Rule and is followed by 24 states. This approach focuses on the type of business in determining whether notice is necessary for the property owner. For example, there is no need to prove the owner knew or should have known of the dangerous condition if the condition was reasonably foreseeable in the course of the owner's business. For example, a gas station can reasonably foresee a small gasoline spill, or a business that has a self-serve beverage machine can reasonably expect someone to spill a drink on the ground. Before bringing a lawsuit in a slip and fall case, it is important to look into your state's law to see which approach is followed. If the injured party proves the Defendant's negligence, they can recover damages, otherwise known as compensation to restore the injured to the same position they were in prior to the accident (to the extent that you can). Although money cannot restore someone's loss of enjoyment of life or permanent injury, it is the closest way to restore someone to their previous health. Damages that are available include compensatory damages, which are current and future losses from the accident, including medical expenses, lost wages, any loss in earning capacity (if you cannot return to work) and damages for physical pain, emotional distress, loss of enjoyment of life, and any loss in function or appearance to your body. If you have been injured in a slip and fall accident in the Louisiana area, which you believe is due to a property owner's negligence, we'd like to hear from you. Call us 504-527-6225 or contact us online for a FREE consultation.